RETRACTION/ CORRECTION: I originally posted this article challenging the thought that you are more likely to die in a fatal car accident than during a VBAC. I tried to crunch the numbers in the way that I felt most accurate. However, it has been bugging me ever since because there is no accurate way to compare these two events and I should have emphasized that more. We can accurately and fairly compare the risks of VBAC to the risks of a repeat cesarean or the risks of a first time mom. However, it is a misleading to compare the risks of birth to non-birth events because they are too different. While I did discuss this at great length at the end of this article, the title I originally chose (Myth: Mom more likely to die in car accident than VBAC) just continued to feed this false comparison. I have since updated the article and title. I apologize for any confusion I caused. On fatal car accident statistics: There are many, many variables that factor into an individual’s risk of dying in a car accident. The most accurate way to calculate your risk is by miles driven. To learn more, please refer to the NHTSA’s document “Understanding Highway Crash Data.” I use the figures below in order to get an average rate for the purpose of discussion. On terminology: Read why I use the term TOLAC. If your husband is worried about you dying during a VBAC, tell him you are four times more likely to die in a car accident on your way home from work today. Sorry if that sounds morbid, but the odds of the mother dying in a VBAC are truly minuscule. Another article (filled with inaccurate statements, contradictions, and oodles of statistics without sources) recently making the rounds on Facebook says one of the risks of hospital birth is the 1:10,000 risk of a fatal car accident on the way to the hospital. While these statements are very comforting, as birth myths tend to be, they are false comparisons. We can accurately and fairly compare the risks of a TOLAC to the risks of a repeat cesarean or the risks of a first time birth. However, it is a misleading to compare the risks of birth to non-birth events. Try not to compare unlike risks. For instance, the all-too-often-used comparison ‘you’re more likely to be hit by a bus/have a road accident than to…’ will generally fail to inform people about the risks they are facing because the situations being compared are so different. When people assess risks and make decisions, they usually consider how much control they have over the risk. Driving is a voluntary risk that people feel (correctly or not) that they can control. This is distinctly different from an invisible contamination of a food product or being bitten by a malaria-carrying mosquito. Comparing the risk of a non-communicable disease, for example diabetes or heart disease, to a communicable disease like HIV/AIDS or leprosy, is similarly inappropriate. The mechanisms of the diseases are different, and the varying social and cultural views of each makes the comparison a risky communication strategy. Take away message: Compare different risks sparingly and with great caution because you cannot control how your audiences will interpret your use of metaphor. Your annual or lifetime risk of something happening will often be higher than your risk of a birth related complication. But this is because the annual risk of something measures your risk for 365 days. The lifetime risk of something is often based on 80 years. You are likely to be in active labor for one day, maybe two. To compare the risk of something that happens over 1-2 days to the aggregate risk of something that could happen any day over 365 days or 80 years is unfair and confusing. An oft-reported estimate is the lifetime breast cancer rate among women. This rate varies around the world from roughly three per cent to over 14 per cent. In the United States, 12.7 per cent of women will develop breast cancer at some point in their lives. This statistic is often reported as, “one in eight women will get breast cancer”. But many readers will not understand their actual risk from this. For example, over 80 per cent of American women mistakenly believe that one in eight women will be diagnosed with breast cancer each year. Using the statistic ‘one in eight’ makes a strong headline but can dramatically misrepresent individual breast cancer risk. Throughout her life, a woman’s actual risk of breast cancer varies for many reasons, and is rarely ever actually one in eight. For instance, in the United States 0.43 per cent of women aged 30–39 (1 in 233) are diagnosed with breast cancer. In women aged 60–69, the rate is 3.65 per cent (1 in 27). Journalists may report only the aggregate lifetime risk of one in eight because they are short of space. But such reporting incorrectly assumes that readers are uninterested in, or can’t comprehend, the underlying statistics. It is critically important to find a way, through words or graphics, to report as complete a picture as possible. Take away message: Be extra careful to ensure your readers understand that a general population estimate of risk, exposure or probability may not accurately describe individual situations. Also, provide the important information that explains variation in individual risk. This might include age, diet, literacy level, location, education level, income, race and ethnicity, and a host of other genetic and lifestyle factors. To compare events that are so different like the risk of a fatal car accident and the risk of TOL maternal mortality is inaccurate and doesn’t help moms understand their options. Your risk of a car accident depends on how much you drive, when you drive, if you are distracted or on medication, etc, etc, etc. The variables that impact your risk of dying during a TOLAC are very different. However, one way these two events are similar: Sometimes we can make all the “right” or “wrong” decisions and the element of luck will sway us towards a good or bad outcome. False comparisons and birth myths like this are shared with the best of intentions. So often the risks of VBAC are exaggerated for reasons having nothing to do with the health of baby and mom. Birth advocates share these myths (which they believe to be true) as a way of boosting the morale of moms seeking VBAC as these moms are constantly faced with a barrage of unsupportive comments from family, friends, and even care providers. The problem is, women make plans to have a home VBAC/VBAMC based on these myths. They make these plans because birth myths make the risk of VBAC, uterine rupture, infant death, and maternal death look practically non-existent. That is dangerous. Perpetuating these myths impedes a mom’s ability to provide true informed consent. If a mom thinks her risk of uterine rupture is similar to a unscarred mom or a unscarred, induced mom, or less than her risk of getting struck by lighting or bitten by a shark, she does not have accurate picture of the risk. And if she doesn’t understand the risks and benefits of her options, she is unable to give informed consent or make an informed decision. Birth advocates get all up in arms about the mom who plans an elective, primary cesarean section without “doing her research.” Or the mom who consents to an induction at 38 weeks because her OB “said it was for the best.” Or when an OB coerces a mom into a repeat cesarean by saying the risk of uterine rupture is 15%. Shouldn’t we be just as frustrated when moms plan (home) VBACs based on misrepresentations of the truth? Shouldn’t we hold ourselves to the same standard that we expect from others? The second problem with perpetuating these false comparisons and myths is that once women learn the true risks, they seem gigantic in comparison to the minuscule risk they had once accepted. Now VBAC seems excessively risky and some lose confidence in their birth plans. Birth advocates do not support moms by knowingly perpetuating these myths. The reality is, the risks of VBAC are low. We don’t need to exaggerate or minimize the benefits or risks of VBAC. If we just provided women with accurate information from the get go, they would be able to make a true, informed decision. The third problem is that we really look dumb when we say stuff like this. If we want to be taken seriously, we really need to double check what we pass on. I encourage you to ask for a source when someone says something that sounds too good to be true or just plain fishy. (And hold me to the same standard!) I often ask people for a source for their assertions… with varying results. Sometimes people have a credible source available and share it with me. I learn more and it’s all good. Other times, people get angry. They think I’m challenging them or trying to argue with them. But the truth is, I’m just trying to learn. What I have found is, when people get angry, it’s sometimes because they don’t have a source and they are insulted that I didn’t accept their statement at face value. They have just accepted what a trusted person told them as the truth and expect me to do the same. Doesn’t it strike you as odd that some people encourage the continual questioning of OBs and the medical system, yet expect you to accept what they say as The Truth no questions asked? “Question everyone but me.” Why? Why is it when we question an OB, that’s a good thing, yet when we hold our birthy friends and colleagues to the same standard, that is being argumentative? I say, ask for the source. From everyone. It is inaccurate and misleading to compare two events that are as different as a fatal car accident and TOL maternal mortality. Period. Let’s stop this false comparison and bring us back to what we should be comparing TOLAC/VBAC to: the risks of a repeat cesarean. 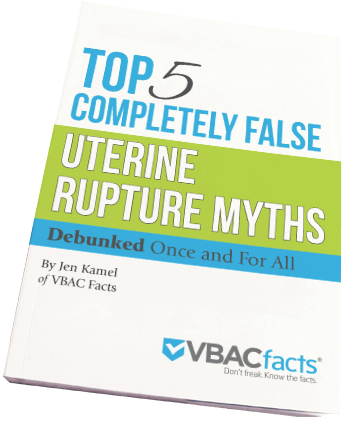 When women plan a VBAC based on false information, their confidence can be shattered when they learn that the risk of uterine rupture and maternal death are much higher than they were lead to believe. When women plan a VBAC based on false information, they are deprived of their right to informed consent. While the risk of scar rupture is very different than the risk of a fatal car accident, it is similar to other serious obstetrical emergencies such as placental abruption, cord prolapse, and postpartum hemorrhage. But, if we were going to compare the unlike risks of a fatal car accident and TOLAC, this is how I would do it: compare the daily risks of the events. Overall rates of maternal harms were low for both TOL [trial of labor] and ERCD [elective repeat cesarean delivery]. While rare for both TOL and ERCD, maternal mortality was significantly increased for ERCD at 13.4 per 100,000 versus 3.8 per 100,000 for TOL . . . The rate of uterine rupture for all women with prior cesarean is 3 per 1,000 and the risk was significantly increased with TOL (4.7/1,000 versus 0.3/1,000 ERCD). Put another way, there is a 0.0038% (1 in 26,316) risk of maternal death during a trial of labor. For a mom to die is very rare. But remember, 0.0129% (1 in 7,752) is the annual rate of Americans dying due to car accidents. To compare something like your annual risk of a fatal car accident to your risk of dying during a TOL is an unfair and inaccurate comparison. It would be more accurate (though still a false comparison) to compare your daily risk of a fatal car accident (because most people travel in a car every day) to the risk of maternal death during a TOL because you are not in labor every day for a year. Let me explain. Often this false comparison is expressed as, “You are more likely to have a fatal car accident on the way to the hospital than have a uterine rupture or die during a VBAC.” But the risk of a fatal car accident on the day you drive to the hospital is not 1 in 7,752. That is your risk over a year. We have to estimate your risk on that day you drive to the hospital by dividing 0.0129% by 365 days which equals 0.00003534% or 1 in 2,829,458. What about the risk of uterine rupture? Using the 0.47% (1 in 213 TOLs) risk of scar rupture (Guise, 2010), the risk of a fatal car accident is 13,283 times smaller. Why don’t we spread the risk of rupture/maternal mortality across the entire pregnancy? I get this, but I also get why using annual stats of car accidents would be accurate when you are looking at uterine rupture rates themselves and not just during TOL, since a risk of rupture exists throughout pregnancy and not just during labor and mom would be pregnant for approximately 10 months or more. I wondered about the best way to crunch the numbers because these events are so different and thus so difficult to compare. In the end, it is a false comparison, but here was my original thinking…. Most Americans are in a car everyday, so they have that risk – no matter how small – every day unless they are not in a car in which case their risk is zero. The risk is primarily associated with being in a car. The risk of uterine rupture and maternal mortality is primarily associated with being in labor, so we can’t spread the risk of rupture/maternal mortality across the whole pregnancy because the risk of rupture/maternal mortality is not the same from conception to delivery. One study examined 97% of births that occurred in the The Netherlands from 1st August 2004 until 1st August 2006 and found that 9% (1 in 11) of scar ruptures happened before the onset of labor. When we take 9% of the overall rate of scar rupture 0.64% (1 in 156) (including non-induced/augmented, induced, and augmented labors), we get a 0.0576% (1 in 1736) risk of pre-labor scar rupture and a 0.5824% (1 in 172) risk of rupture during labor (Zwart 1009). Since the risk of rupture is not the same over the entire pregnancy and labor, we cannot accurately calculate a daily risk of rupture. In other words, the risk of rupture is rare before labor (0.0576% or 1 in 1736) and then becomes uncommon when labor begins (0.5824% or 1 in 172). Even though we could go into labor anytime during pregnancy, the risk before we go into labor is so small in comparison to the risk when we actually go into labor. You make such a good point here about both ‘sides’ doing women a disservice if we rely on rhetoric – I think everyone must take responsibility for being truly informed and for encouraging others to do the same. This is excellent food for thought. I am not sure if this is the best place to ask, but wondered if there are any stats ‘out there’ about successful VBAC births and whether or not this has a statistical effect on uterine rupture chances in subsequent planned VBACs? One study did find that after a successful VBAC, the future risk of uterine rupture, uterine dehiscence, and other labor related complications significantly decreased (Mercer, 2008). Counter this with the fact that cesarean risks, including placenta accreta, hysterectomy, blood transfusion, and ICU admission, increase with each surgery (Silver, 2006). You definitely have a lot of good points in this post! I would argue though that since you can’t have a VBAC every day…it is somewhat “fair” to compare the annual risk of dying in a car crash to the annual risk of dying while attempting VBAC…or reduce it to the risk over 9 months if you must. People just need to be clear when making that comparison. Of course then you get back to the issue of comparing dissimilar risks…which VBAC vs. car crash is definitely a dissimilar risk! Someone on Facebook made a similar comment which I just added to the article above. Check out my reasoning for why I didn’t spread the risk of rupture/mortality across the entire pregnancy and let me know what you think!